To make the brûléed oranges, sprinkle one side of the orange slices with sugar. Heat a dry skillet over medium-high heat. Once the skillet is hot, add the orange slices sugar-side down and cook until lightly caramelized, about 1-2 minutes. 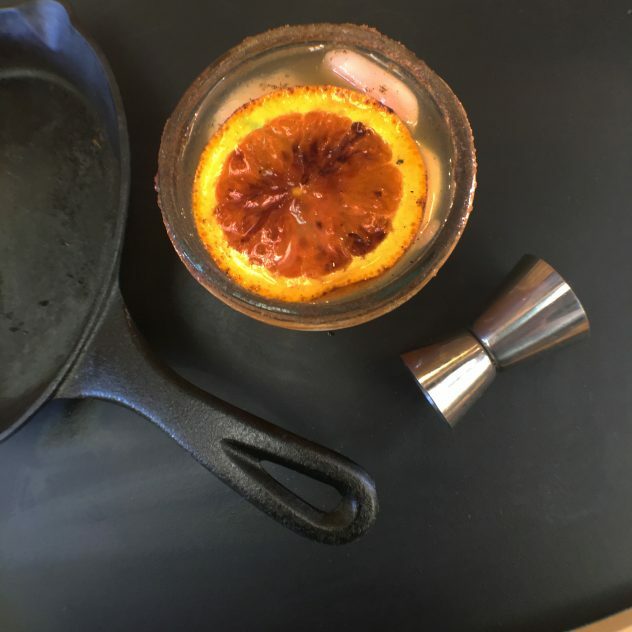 Remove the orange slices from the skillet and place them on a plate with the brûléed-side facing up. Set aside. Stir together all of the ingredients for the cinnamon-sugar rim and place the mixture on a small plate. Wet the rim of your glasses with some of the apple cider, then invert the glasses over the cinnamon-sugar mixture, pressing down to coat. Add a few ice cubes to the glasses and set aside. To make one cocktail, squeeze half orange, add 3/4 cups apple cider, 1 1/2 ounces (= 1 shot) bourbon, and 3/4 ounces ( = 1/2 shot) amaretto (or maple syrup) to a cocktail shaker with ice. Shake well. Strain into one of your prepared glasses. Float a brûléed orange slice on top. Enjoy immediately. Chill an old fashioned or martini glass. Drizzle or swirl Hershey’s syrup inside glass, chill longer if desired. Add ice and coffee moonshine; top off with half and half. Drizzle Hershey syrup into a heart or design of your choice on a waxed paper lined chilled baking sheet and place in freezer to harden. Served chilled in the Fall and warm in the Winter! Add all the ingredients to a pitcher and refrigerate for at least 12 hours. 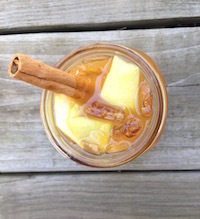 Serve in mason jar, garnished with apple or pear slices. 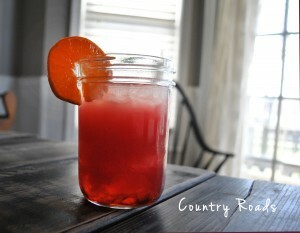 For a video on how to make this cocktail, click here. Pour all ingredients over half glass of ice; garnish with slice of sweet/semi-tart apple or orange slice. recipe courtesy of Sarah B.
Pour all ingredients over ice in a shaker, combine and strain into a martini glass. Garnish with lime wedge. Enjoy! 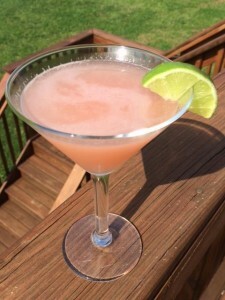 * Tip: If the fresh grapefruit juice is too sour, just add a bit of simple syrup when you mix the ingredients, or you can also use bottled juice (that’s usually sweeter). 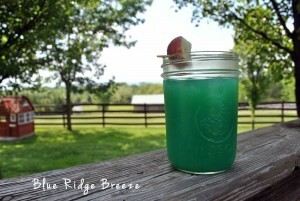 Great summer Tiki-Syle Party Drink! 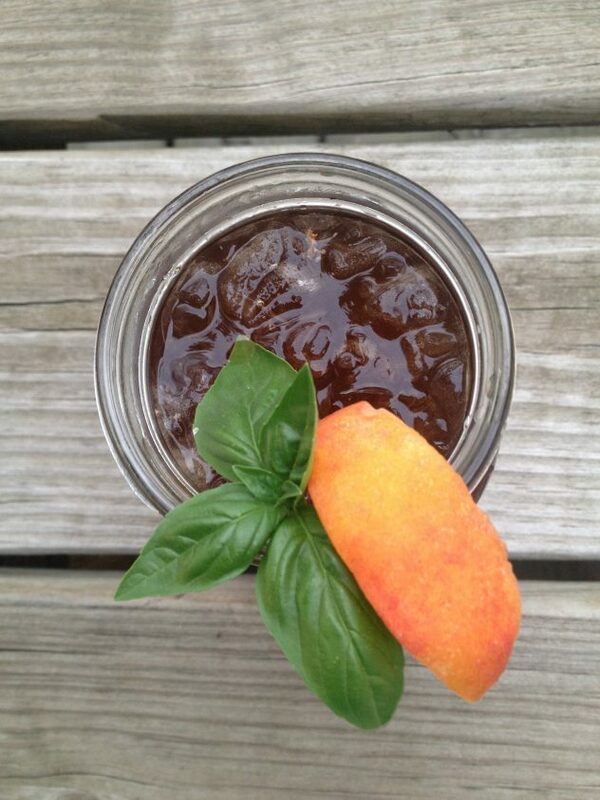 Shake well and strain into a mason jar or highball glass with fresh ice. Top with a splash of seltzer and garnish with a orange wheel. Whether made from scratch or with the mix of your choice, start your day with this nutritionally packed supercocktail! Pour some celery salt onto a small plate. 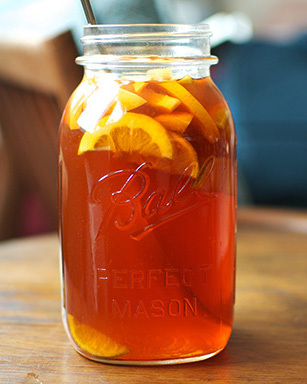 Rub the juicy side of the lemon or lime wedge along the lip of a mason jar or glass. Roll the outer edge of the glass in celery salt until fully coated. Fill with ice and set aside. Squeeze the lemon and lime wedges into a shaker and drop them in. Add the remaining ingredients and fill with ice. Shake gently and strain into the prepared glass. Garnish with a celery stalk and a lime wedge. 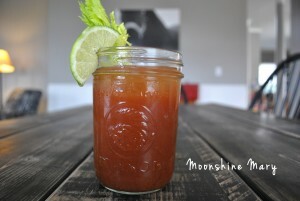 If you fancy more of an add a mix to ‘shine and go, try one of our favorites, Fat and Juicy Bloody Mary mix. Who would’ve thought one of the most popular American Western folktale songs from childhood would be just the cure for a winter blues? 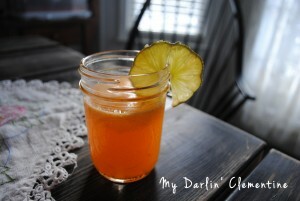 Delicious and refreshing and bursting with vitamin C to boot. Enjoy! Shake well and strain into a highball glass with fresh ice. Top with a splash of seltzer and garnish with a lime wheel. 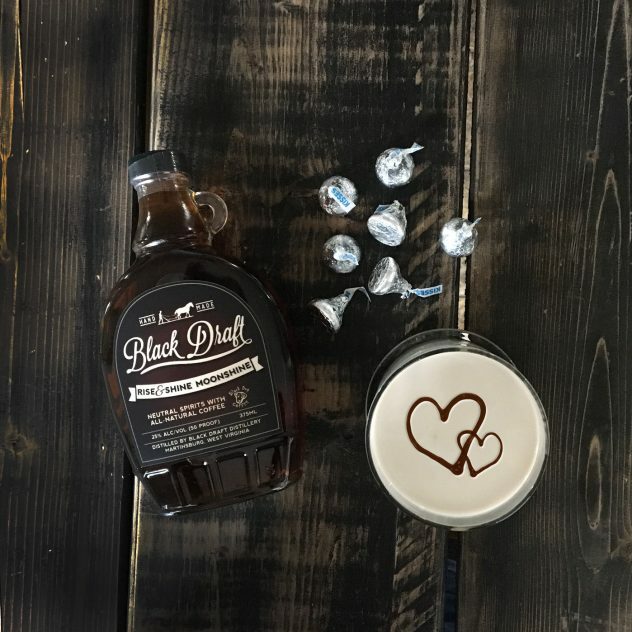 Bringing you our favorite way to celebrate this season with some yummy Eggnog a.l.a Black Draft Moonshine. 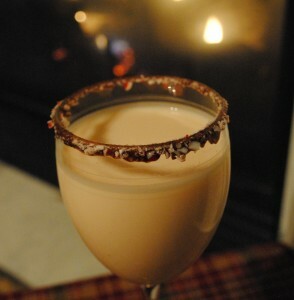 Place candy cane in pitcher, add moonshine and eggnog, stir and chill for at least one hour (overnight is best for full flavor). The candy cane will dissolve. Serve chilled in jar or glass of your choice. Place 9 cups of watermelon cubes in a blender; blend on high until very smooth. Strain juice through a mesh strainer into a large pitcher. Pour the wine, moonshine, triple sec, and honey into the pitcher. Stir to combine. *Note—when making a batch of any recipe, add 2-3 oz. of First Harvest Moonshine per/8 oz. of your pitcher or container size. Per example, a 64 oz. container would take 16 to 24 oz. (or 2-3 cups) of moonshine. 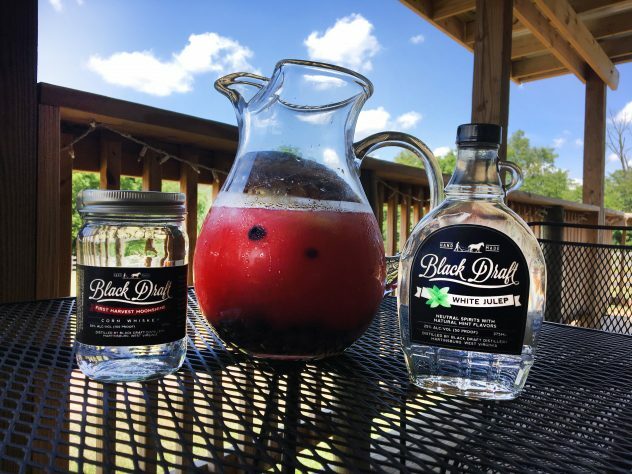 You should just faintly taste the moonshine, after chilling the flavor of the alcohol will infuse more with the other ingredients. Enjoy! Stay tuned for even more recipes and other good stories!